Okay, let’s just say it right off the top, we all like lists. They are easy to comprehend and digest. They fit nicely into our innate need for order. And when we see our name appear, woohoo! But sometimes times top lists are actually really useful and interesting and that’s the case with the one that Jurgen Appelo created over at noop.nl. The post title is Top 150 Management & Leadership Blogs and while you’ll be familiar with a large number of them, there are lots of other new and interesting ones to explore. And to me, that’s the real power and value of a list like this: to introduce us to something or someone new. Of course, we were delighted that Weekly Leader made the list (34) right between our colleagues Wally Bock’s Three Star Leadership (10) and Ed Brenegar’s Leading Questions (44). Thanks Jurgen for taking the time and putting in the effort to create this very valuable leadership resource. We look forward to updates in future years. 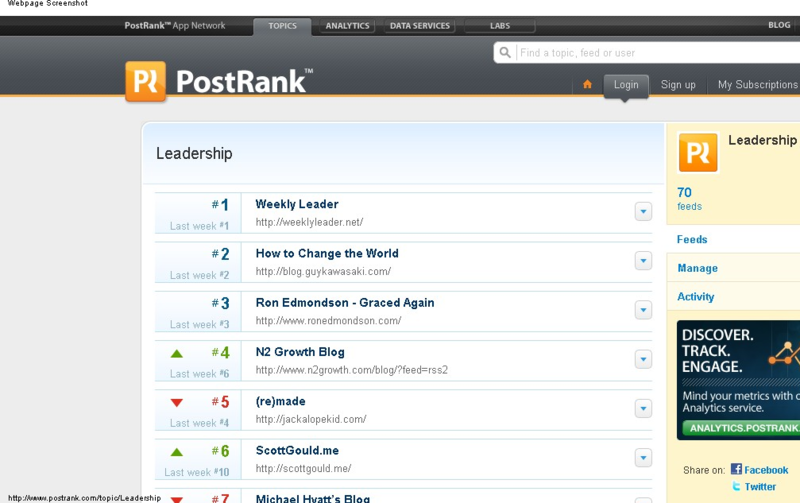 PS – We were excited to spend another week atop PostRanks Leadership blogs. (April 10, 2010 / live link) Weekly Leader’s objective is use various forms of digital media to regularly engage leaders and students of leadership so that’s what makes our PostRank’s position, so satisfying. It fluctuates from week to week but that’s not a bad thing either. Thanks PostRank! Tagged with Jurgen Appelo, noop.nl, PostRank, top leadership blogs.